Every year our church has Christmas Carols on the church ground, with lots of entertainment, often including bouncy castles and a live nativity. We promote this to our local community by delivering about 6,000 invitation cards. This is a joint effort with many people taking a bundle of a few hundred cards and delivering them. We help out most years. In the past we have walked, perhaps with the pram with one or more kids on-board. It takes somewhere from 4 to 5 hours to do the delivery run we normally choose, in large part because of the overall distance to cover. 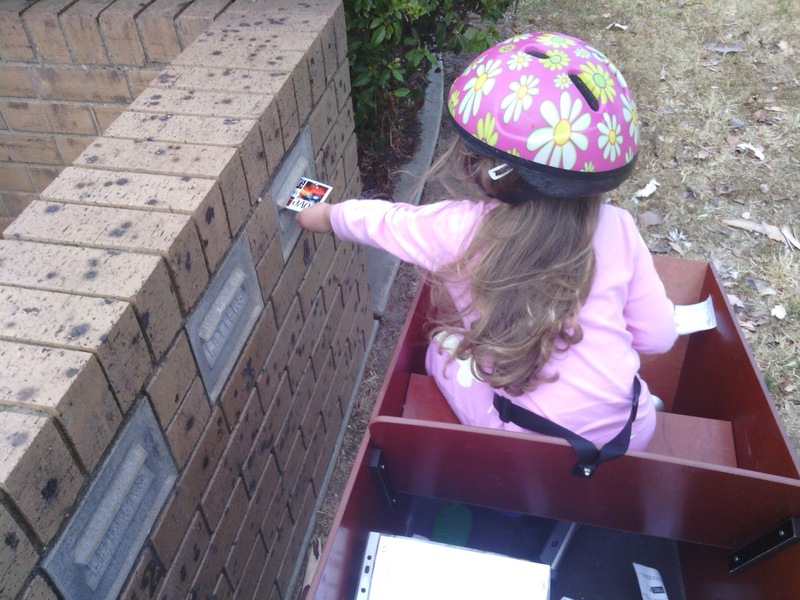 But now that we have the bakfiets, it occurred to me that a child on board would be at about the right height to post the letters, and of course we could cover the ground more quickly. So that is what we did. Here is Isabel being super-helpful posting one of the slips. It was both lots of fun, and much faster -- we were all done in just under two hours. Carols this year will be on the 9th December, Marion Church of Christ car park, Corner of Marion and Alawoona Avenue, Mitchell Park. Entertainment begins 5:30pm, with carols starting at 7pm.